Hackuarium is proudly using infrastructures provided by UniverCité, an unconventional innovation hub that opened in May 2014 in the IRL building in Renens. Our equipment is mostly upcycled material from institutions and industries from western Switzerland. We have documented our working environment as it has evolved. Between December 2015 and January 2017, UniverCité regrouped our laboratory, a workshop and coworking space. The original space was under construction work from January until June 2017, and we temporarily relocated on the first floor of the same building. Since July 2017, we are back on the second floor of what is now called the "Ateliers de Renens" Chemin du Closed 5, 1020 Renens. We have a biohackerspace where (almost) everything goes, and a P1 facility for synthetic bio enthusiasts and more. Renens is a hopping hub between Lausanne and Geneva. You can get to us by train from the airport in Geneva within an hour. Our members reflect the diversity that is in and around Lausanne/Renens. 2018.05.19 Saturday 14:30-18:30: Hack ton doudou workshop - Our friends from FabLab Onl'fait will teach us doudou hacking! 2018.05.16 Wednesday 19:30-22:00: Swiss Engineers visit Hackuarium - Looking forward to an evening of Moss music? Join us! 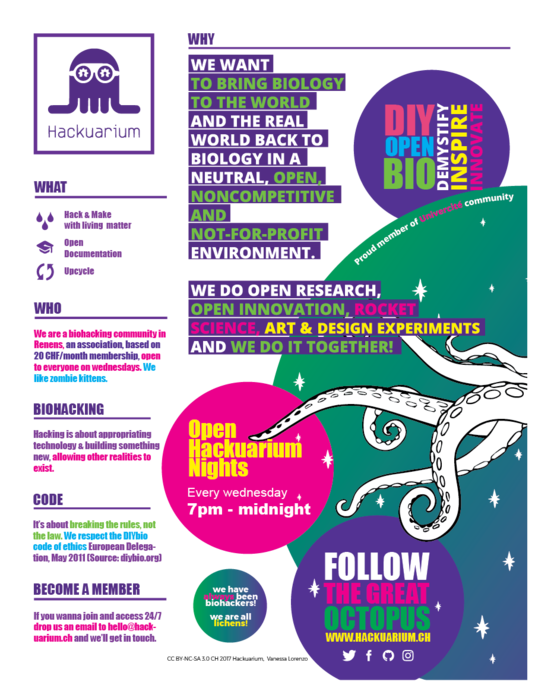 2018.05.02 Wednesday 19:30-22:00: 200 weeks of Hackuarium - We should celebrate! A film night (Gattaca? Hackers??) might be fun?? Help us spread the love for tech, science, art and design. Our 'online promotion' specialist will get in touch to ask for content and will make sure the announcements are made on all the social media outlets for Hackuarium! In case you need a microgrant to cover the costs (up to 300.-), send an email to board@hackuarium.ch with a description (what, when, who) and a preliminary budget. Is there a SIMILAR workshop ALREADY planned? If yes, negotiate dates and: Do you target the SAME people? If yes, negotiate. If not, no problem. It maybe interesting to see what others do. Make sure the date, time and title are provided. Save the main page. The event will appear with a link. By clicking on this link you will create the event page. Add a text description providing more details about the event. Biohackers. The politics of open science by Alessandro Delfanti (2013) London: Pluto Press. Delfanti, Alessandro	-	Is Do-it-Yourself Biology Being Co-opted by Institutions?